Shop Customers Only until main release. 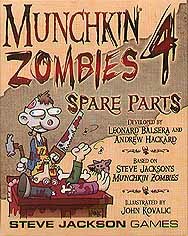 The undead munchkins return once more in this 56-card expansion for Munchkin Zombies, with a bunch of new ways to get those pesky survivors and eat their braaaaaiiins! Take on a new Power, Solo, and show the other zombies on the block who's boss. Pick up the Spare Parts and Bowling Gloves and take on Your Ex-Roommate! Get Your Second Wind so you can defeat the formidable Surgeon General, but make sure you don't get hit with Curse: Dead Heat!